I hope you are making the most of the discerning energy driving this day, brought to you by the Moon in Virgo. Apply it — along with REorganizing potential of Mercury retrograde — and REview your projects, files and closets. Separate what no longer serves (“serve” is Virgo’s middle name) and chuck it! Moon entered Virgo yesterday (Monday) at 9:41 PM ET. Before then, Moon was void in drama king/queen Leo. A Moon void means that the energy of the day has a higher probability of wandering off-course. Hopefully you rolled with any twists or flakes that interfered with your efforts to move forward in a straight line. A crisis that came up was likely to have been much ado about nothing, dramatic as it may have seemed. Yes? Emotions are on the rise, as the Moon waxes to fullness on WEDNESDAY at 9:43 PM ET. Tomorrow is also marks the start of the astrological new year, as the Sun leaves Pisces and charges into Aries at 5:59 PM ET. As much as all the Aries in the room would love to just get to the me-me-me Aries part of the discussion, we need to break down what will happen before the Sun enters Aries, because those patterns reflect what’s been happening over the past few days. Ready? TUESDAY — Moon travels without interference from the other planets for most of the day. Keep on sorting, reviewing, revising, reorganizing — in an effort to get it right. Know that since Mercury is retrograde, your efforts may be up for review again after March 28th, when Mercury turns direct. Still, double check the details thrice this evening, as Moon opposes foggy/dreamy Neptune just after midnight — ET. It will help you get from Point A to Point B without ending up in Point C.
WEDNESDAY — A valiant effort to separate facts from fiction marks the morning. I hope the facts prevail, because at 7:37 AM ET, Mars (planet of action and aggression) harmonizes with Pluto (planet of power, resources and breakdown). Over the past several days we’ve had an easy flow of physical/assertive energy at our collective disposal. If this pattern personally affects your unique horoscope (consult your astrologer for details), it has facilitated the execution of your marathon effort — the one you’ve been planning for months and months — for better or for worse. At 10:28 AM ET, Mercury (how we need to think) harmonizes with Saturn (necessary controls; patriarchy, structure). Upside potential: authentic intuition facilitates structure. Downside potential: delusional beliefs facilitate authority.Watch the headlines. Whatever communication is expressed, it’s likely to be grand or grandiose, suggested by the Moon’s challenging contact with Jupiter (expansion!) at 11:22 AM ET. After that release, Moon goes void, once again traveling without focus. If it feels like the end of the world, do not despair. You’re just tuning in to the Sun at the verrrrrry last gasp of Pisces, which definitely IS the end, if you happen to be a caterpillar. But at 5:59 PM ET, the Sun (and all caterpillars) is born anew when it ends the inevitable beginning in Aries. Happy Vernal Equinox — happy first day of Spring! Aries is the baby of the zodiac, ruled by warrior Mars. Courage, self-reliance, inspiration and a pioneering spirit are keywords for the Sun in Aries, sign of the Ram (as in battering). There is no greater crusading champion for the underdog when Aries is at its best. Downside potential: insufferable self-absorption, impatience and a tendency to jump off cliffs or fall down stairs because it’s faster than walking. You think I’m kidding? Here is one of my fave Exhibits: Justin Trudeau, who has Moon in Aries in touch with wacky Uranus, showing us on tape how he falls down stairs. What fun he must be at parties. The mantra for Aries is I AM. Here’s what you need to know about the first day of any season from an astrological point of view. The first day of Spring, Summer, Fall and Winter corresponds with the first day (or first DEGREE) of Aries, Cancer, Libra and Capricorn, respectively. Got that? Good. These four signs are called CARDINAL signs of the zodiac, with “cardinal” here suggesting (from the Latin root of the word), “that on which something turns or depends.” Cardinal signs take ACTION. They INITIATE. Nothing happens without ACTION. And action leads to NECESSARY CHANGE. As in a change of seasons — suggested by solstices and equinoxes. Clear? The first day of a season is prominent in our culture, right? We make a big deal over it — yes? So can you see that in astrology, we observe that PLANETS at the first degree of a cardinal sign (Aries, Cancer, Libra & Capricorn), tend to pack a more powerful, prominent punch. They suggest ACTION which leads to CHANGE — prominently! The first degree of the cardinal signs is known as the ARIES POINT. Got that? If you have a planet or angle at the Aries Point, you can expect that the energy of that planet will demand prominent expression in your life. Your friends and family — and perhaps the entire free world — will notice it. William Shatner was born with the Sun at 0 Aries. “To boldly go where no man has gone before”? I should think so — and the whole world knows him for playing that role. Moving right along…to 9:28 PM ET on WEDNESDAY, when the Moon leaves Virgo and enters Libra. A Libra Moon needs to be appreciated for being fair, diplomatic and people-pleasing. If you have one in your horoscope, this is the key to your happiness. At 9:43 PM ET, the Libra Moon will exactly oppose the Aries Sun, pitting the expression of me-me-me Aries against the we-we-we need of the Libra Moon. Who will win? Illumination and release in matters of diplomacy, partnership and relationship are the likely fallout. Whatever comes out is sure to capture our attention, as this Full Moon is happening at the aforementioned Aries Point. It’s likely to involve leaders — in government and commerce. Watch the news! For further clues to the nature of what is revealed, we can examine the Sabian Symbols for the Full Moon at 0 Libra and the Sun at 0 Aries. If you do not know about these wonderful Sabian Symbols, here is the story. For the Sun: “A woman rises out of water, a seal rises and embraces her;” for the Moon: “A butterfly made perfect by a dart through it.” Thankfully we have Sabian Sage Blain Bovee to help us make sense of these cryptic images. He advises that we be mindful of “emergent moments that initiate a new life-cycle; tender moments of raw emotion that leave a lasting impression. Watch for photographic moments; the desire to capture something in the perfect light.” You’ll find even more insight here and here. 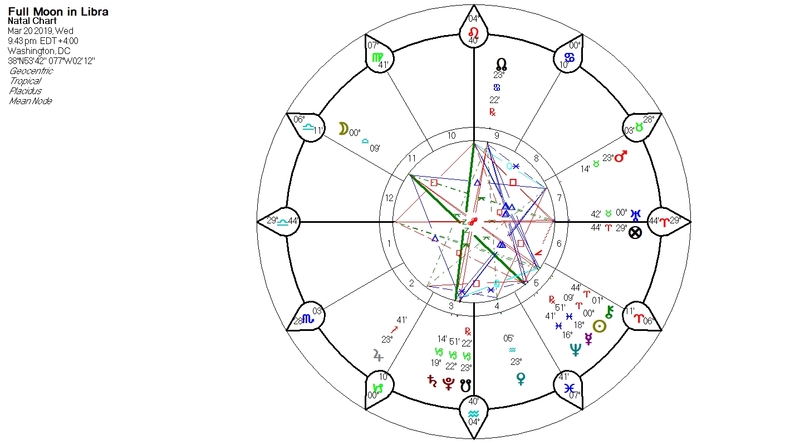 Here is the Full Moon chart set in Washington, D.C.
THURSDAY ..a square (challenge) between Venus (women, money, art, social expression) in Aquarius and Mars (men, assertion, aggression) in Taurus, exact at 4:07 AM ET. If you have a planet or angle around 23 degrees of Taurus, Aquarius, Leo or Scorpio, you are personally affected. My money says you’ve been feeling a build-up of tension demanding a heroic, physical or combative release. This means you, Speaker Pelosi, Majority Leader McConnell and Trump. Be prepared for a provocative initiative or attack, especially for Trump, as transiting Mars triggers his Taurus Midheaven and moves on to his Mars and Leo Ascendant over the several days — told you about it weeks ago — search the archives. Also on THURSDAY — a cooperative connection between Venus and Jupiter, exact at 10:16 AM ET gives those on Team Venus an optimistic boost in the wake of whatever release is provoked earlier in the day. SUNDAY...when Mercury (how we need to think) and Neptune (our need for vision) meet up at 1:26 PM ET. Don’t jump to conclusions; this part of the dance doesn’t end until mid-April. It’s interesting that this pattern will trigger Robert Mueller‘s horoscope now — and again on April 2nd. It will oppose his natal Mars in Virgo, activating his need to act with exacting perfection. We’ll just have to wait and see. 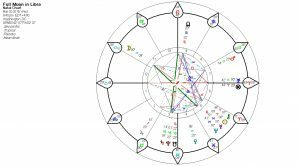 There are no exact aspects among the planets on SATURDAY, just the Moon in Scorpio plumbing the depths for the sake of acquiring knowledge and control. So what do all these planetary patterns mean for you? That’s a topic worth discussing in a personal consultation, especially if you’re either a) feeling stuck and wondering when things are going to change; or b) facing change and wondering what it all means and when it will settle down. These shifts will be clear in the horoscope, prepared in advance of our discussion. If you have children, their horoscopes will accurately outline what they need (vs. what YOU need) in order to fulfill their potential. Lately I’ve consulted with a number of divorced parents who gained insight on how to better manage expectations regarding their ex. Here’s the 411 on these and other ways to use the powerful language of astrology to live life better.